I love these cushions, they have the most beautiful patina. They are made from a vintage handwoven wedding blanket by the White Tai, an ethnic minority from China, Vietnam, Laos and Thailand. They are so called because of the colour of their clothing. The blanket is woven in thick indigo dyed cotton, with symbols in floss silk. The colours are all natural dyes and have faded over time. Some of the floss silk is worn but the blanket is robust because the silk is a supplementary floating weft. 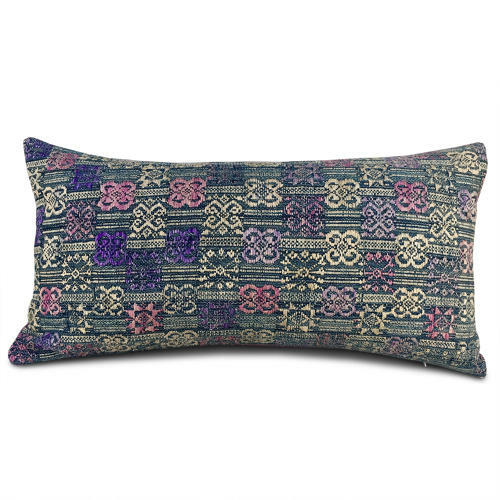 The backs of the cushions are a homespun by the Hmong in Thailand and have been overdyed a lovely muted blackcurrant sorbet colour. The cushions have zip closure and feather pads.